Over the years, I’ve had many patients come to me without any back pain, but with excruciating pain in their buttock, thigh or in their leg. Sometimes, they may also report having cramps in their calf muscle, numbness or pins and needles in their buttocks, legs or feet. Other patients talk of a tightness in their hamstrings. They usually express that their back is okay as they have no pain there. I then explain to them that this is a classic symptom of Sciatic Nerve impingement and that it’s a referral condition due to displaced vertebrae in their lower back. The Sciatic Nerve is a large nerve that runs down the lower lumbar (lower back), buttock and leg (as seen in the illustration). The condition were refer to as Sciatica is any form of pain that is caused by the irritation or compression of the Sciatic Nerve. A displaced vertebrae in the lumbar (lower back) can cause the intervertebral disc to bulge. It can then impinge on the Sciatic Nerve causing pain in the lower back, buttocks and legs. The pain in the leg can run down the back, side or even front of the leg and can often cause pain in the top or on the side of the foot. Numbness in parts of the foot and toes along with a pins and needles sensation is also fairly common in those suffering with Sciatica. 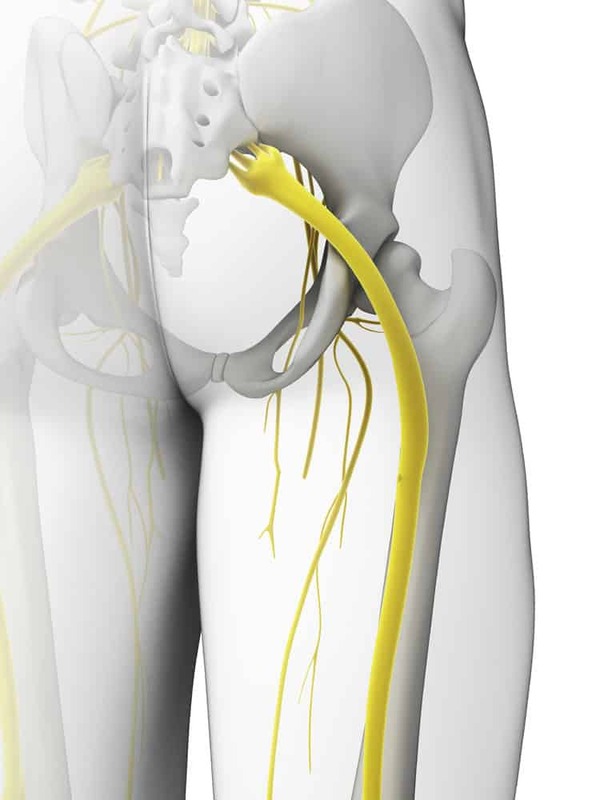 Other symptoms of Sciatica can be a hernia like sensation or a feeling often more associated with groin strain. Patients can be experiencing hip or lower abdominal pain and be having problems with the control of their bladder or bowel movements. If any of this sounds like you, there is no need to continue suffering like this. The good news is that I have been using my unique treatment programme for many years and have achieved what my patients call amazing results – see their testimonials. I’m a Mobile Back Practitioner and I provide treatment for Sciatica and Sciatic Pain in my patients own homes. Providing a mobile service for back treatments, removes the need for my patients to undertake uncomfortable and often painful travel. Sitting in a car of using public transport when suffering from Sciatica is not a pleasant experience. Being able to rest before a treatment and immediately afterwards, will produce better results and a faster recover.